The next generation of Rock Band launches October 6, and instrument bundles now up for preorder—$130 for the guitar and $250 for guitar, mic and drums. Sounds like a good time to hunt for used instruments! I know, I know—stop preordering games. While Luke Plunkett hates the practice with a passion, I still find it has its practical uses, especially for expensive items at retailers that allow you to put down a little cash here and there. That’s how I buy my new consoles when they launch—$50 down, $50 here and there when I have some spare change, and by launch day I am set. 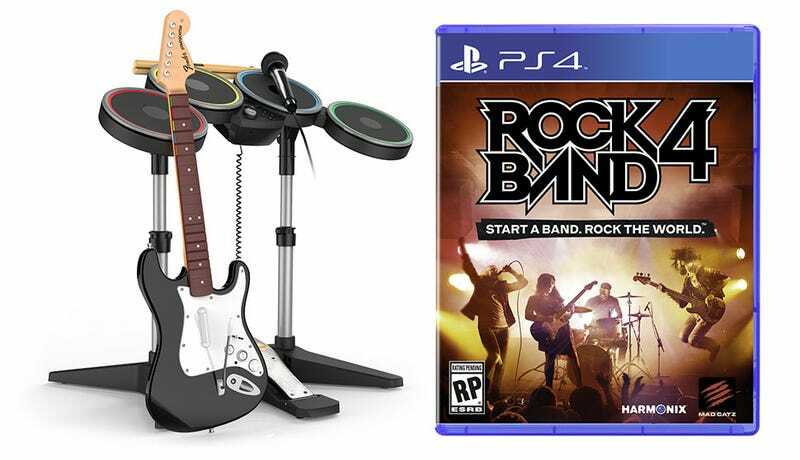 Rock Band 4 for Xbox One or PlayStation 4 with the full band kit surely falls into that price range. The $130 guitar bundle is a little steep compared to Guitar Hero Live’s $100 bundle, but then Guitar Hero Live requires a new controller, and Rock Band 4 let’s you plug in your classic guitar. Your classic guitar, drums and mic will work for Rock Band 4, and should you not have them, surely someone does. GameStop, eBay and anyone else who would take them were flooded with plastic instruments as the rhythm game craze sputtered out a couple of years back, and a full compliment of used working equipment (including an additional guitar) can likely be had for far less than the retail bundle. Then you just have to scrape up $60 or so for the game alone. Addendum: Mad Catz PR dropped a line to mention that the only way to secure the new hardware at launch is to preorder—they say supplies will be incredibly sparse. For more info on Rock Band 4 preorders, the newly-announced freestyle guitar solos (where’s mah drum solos?) and the latest announced songs (“Shooting down the walls of heartache, bang bang), here is a website.